The three lines of triple stitching looks great! 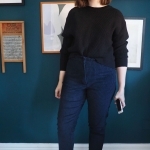 I am very impressed and inspired – I know I’ve said it before, but if ever I manage to make a pair of trousers that fit, the next stop is jeans! 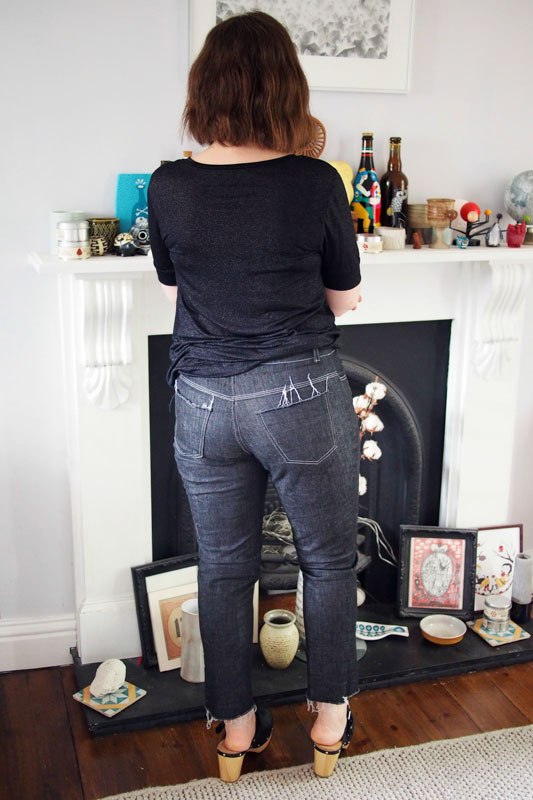 As fitting goes, stretch jeans are pretty easy! BUY IT! It’s a very dark blue/indigo, good weight, sews beautifully and has great recovery. My first pair from this I wore almost daily and have only worn where I cycle (and are still being worn patched, and still very comfortable!) and my second pair are doing very well. I think I will stock up on more for a third (and possibly fourth…) pair. Not much colour choice, but I keep looking elsewhere, and this is a good basic! Thank you for the tip! 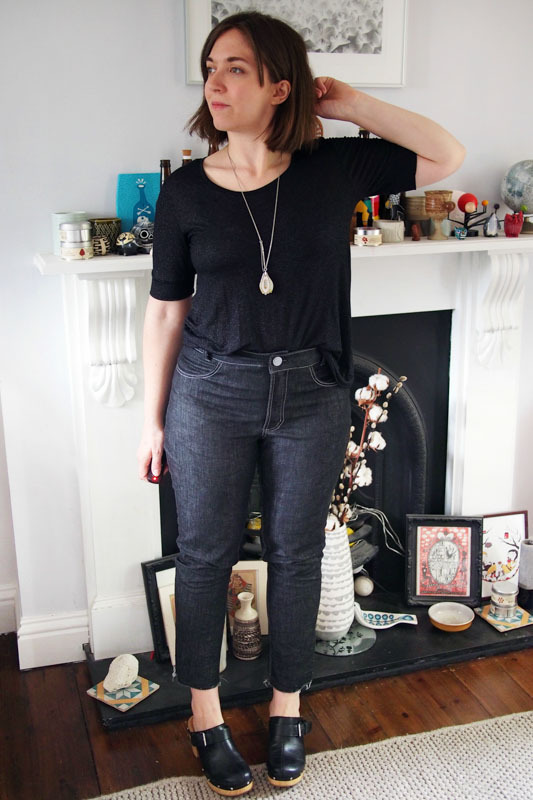 I have some rigid non-stretch jeans using Minerva’s denim and I like it a lot. I love that triple topstitching on the yoke! These look really fantastic Katie – the fit is perfect!! I’m with you on the fact that once you start wearing the jeans you make, the little imperfections really don’t matter as much, and I always find with a couple washes, they always look great anyway. 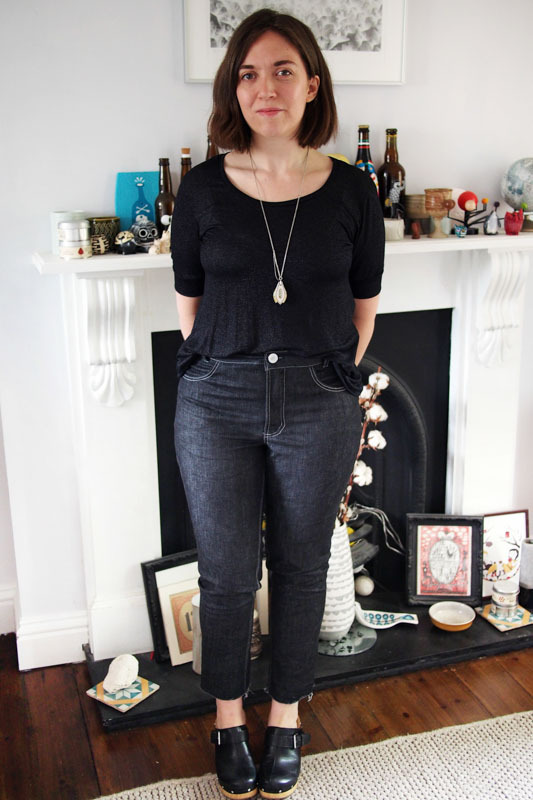 I am a pretty die-hard Cone Mills girl, so I pretty much order my denim exclusively from Katie at Threadbare Fabrics. If you are looking for something specific, I’m sure she would help you find it too. 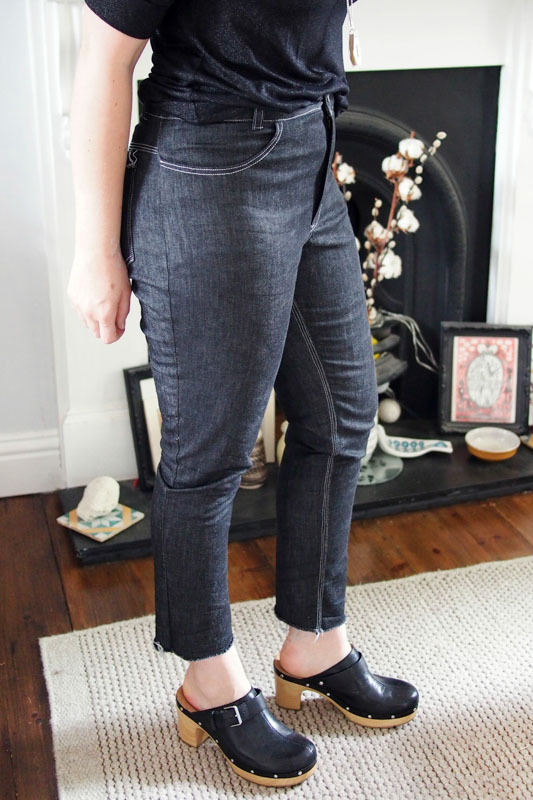 I think I’ve mentioned this before, but I have ordered some Italian Stretch denim from Ditto fabrics and I really liked it. I made my Angela Wolf jeans out off it and they are so comfy. I don’t think the recovery is quite as good as my Cone Mills though. Hope that helps! Good denim is hard to find. Thanks jeans queen! I’m going to order some from ditto I think, I got some samples a while ago that seemed pretty legit. Ooo lovely jeans. I’ve always wondered where to go to buy denim…. I’ll have to make some jeans one day. It’s definitely hard to find the good stuff, you never really know how it will wash/wear. AAAAAH!! I love these! i’ve been hesitating, wanting to make basically this exact pair – thanks for doing it so that I know it looks amazing, you’ve given me the boost I need to get cutting! that cone mills feels so precious I’ve been afraid to make a not perfect jean. No more! love the topstitching and Xed belt loops, too. Yay! 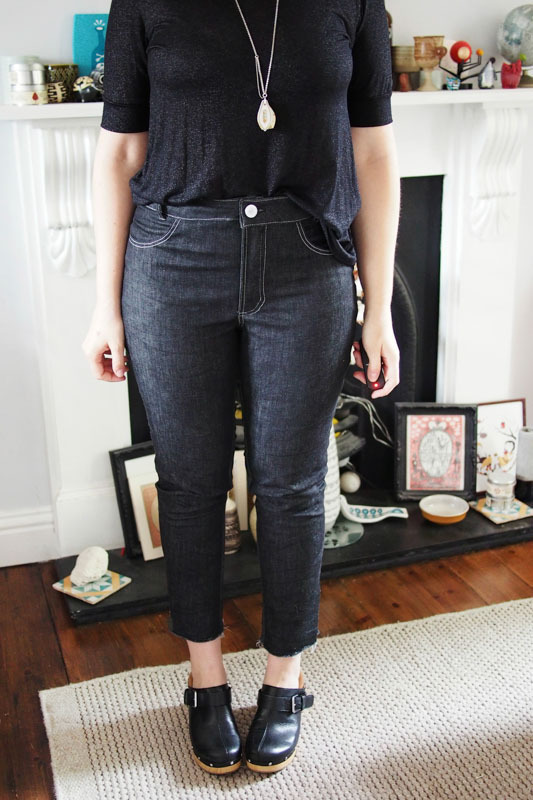 Go forth and sew jeans! Nice! I like the cropped length. I’ve got some of Katie’s denim in my stash, I’m sure it’s black…. Isn’t she stocking it anymore? Hi Sarah!! 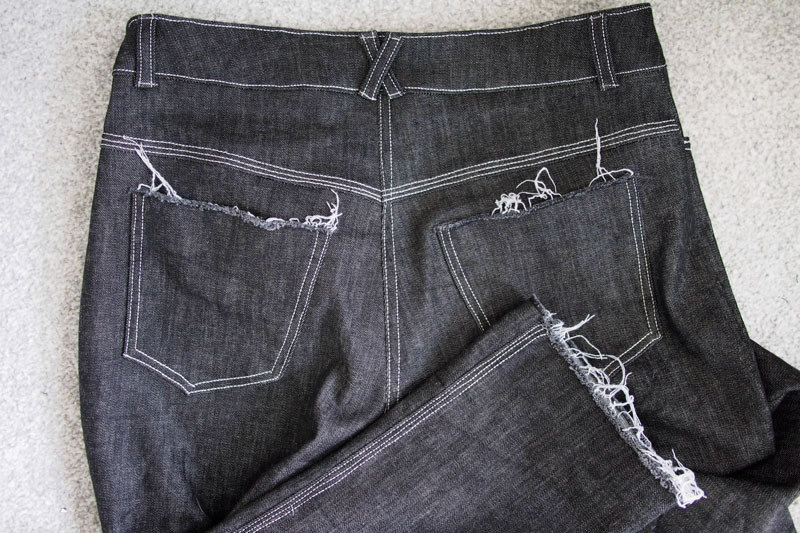 Unfortunately, we’re all out of black and I’ve been searching, but I haven’t found another denim that’s up to snuff yet! :( Hopefully soon though! SOLIDS please, Katie! Keep up the good search! I wonder if I could overdye the Cone Mills? Is that sacrilege? I say, once it’s in your hands – it’s up to you!! I don’t think there’s any problem with dyeing it! Love these, they look great on you! 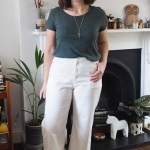 I have been making cropped trousers (cotton poplin and twill) recently to practice fitting and I think I may be ready to take plunge into the ‘Jean Pool’! I’m pretty sure it will be the Ginger ones I try first. I love this twist on the ginger jeans, they look awesome. 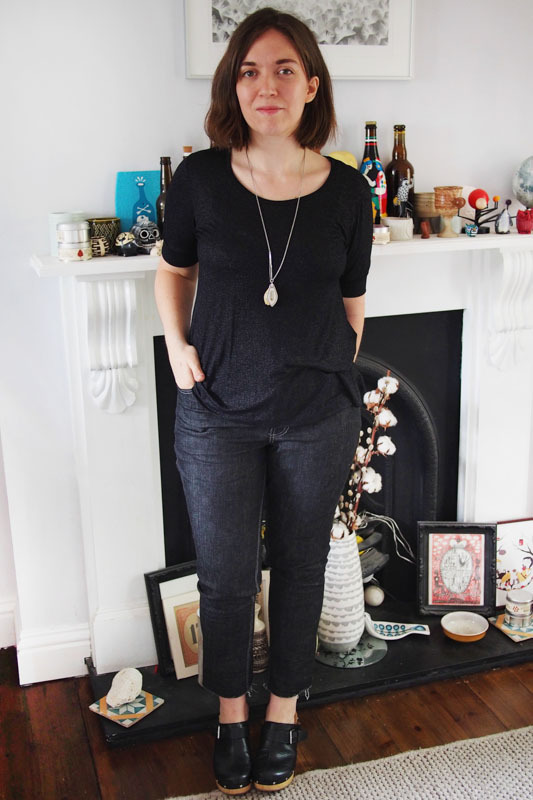 Another UK option for denim is from Organic Textile Company http://organiccotton.biz/store/index.php?route=product/category&path=255_206 I ordered samples (not when they carried black) and they were really nice. Another US option is One Sock Emma, her coloured denim is really nice. I made 2 gingers out of her denim. 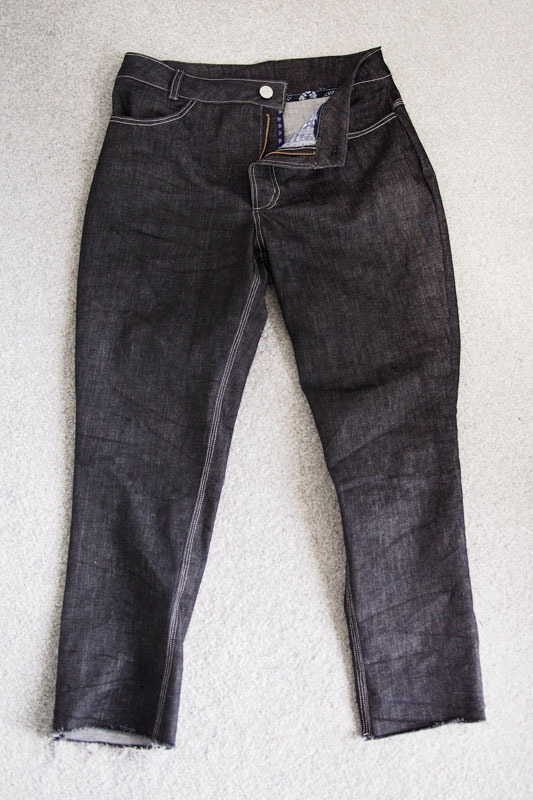 In regards to dyeing, I thought I could get plain black denim by dyeing the Emma One Sock white denim with Dylon. It didn’t work because the poly will not dye so I ended up with an indigo colour instead which was totally fine but just not what I expected. 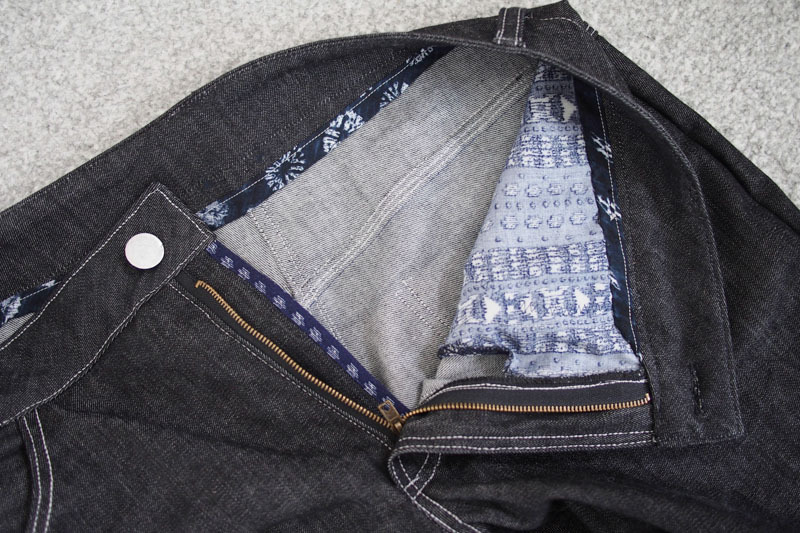 You would have more luck with a lower % of manmade fabric or 100% cotton denim. Thank you – those organic ones look lovely. You might want to try Rit dye, it’s better on synthetic fibres! These are fab! I like the colour denim you have used and the contrasting thread for your top stitching. I recently made a pair of these and I am so pleased with them! I now have the Boyfriend jeans pattern on my to do list. These are fab! I love the frayed details! Nice jeans! Love how you finished your waistband with binding rather than turning under.